Represent your favorite pup in these French Bulldog Plush Animal Slippers by Silver Lilly! 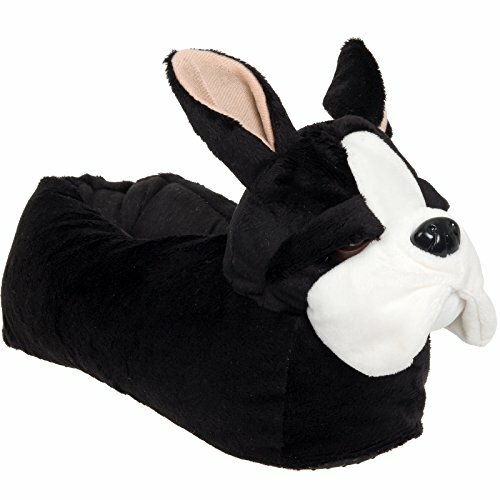 These adorable dog slippers are soft to the touch and comfortable enough to lounge around in for hours. The extra cushioned upper is designed to look like a cute Frenchie, and a gripped outsole keeps your feet firmly in place on slippery wooden and tile floors. The padded footbed adds additional comfort, keeping you comfortable even on harder surfaces. Great for dog lovers of all ages, these precious slippers are a wonderful way to show off your favorite breed! Available in sizes Small, Medium, Large, and X-Large. GRIPPED SOLES - Traction dots throughout the sole ensure your slippers stay right where you want them. PADDED FOOTBED - Cushioned footbed comfortably fits around your feet keeping them nice & warm. FUN - The witty plush dog design lets everyone know what your true love is, dogs. Make any dog lovers birthday, anniversary, Christmas or holiday just that much better! KIDS SIZING - Small fits: Kids shoe sizes 2.5 - 5. Medium fits: Kids shoe sizes 4.5 - 6.5. ADULT SIZING - Small fits shoe sizes: Women's 5.5 - 6.5; Men's 4 - 6. Medium fits shoe sizes: Women's 6.5 - 8.5; Men's 5.5 - 7. Large fits shoe sizes: Women's 8.5 - 10.5; Men's 7 - 9. X-Large fits shoe sizes: Women's 11 - 13.5. Men's 9 - 12. If you have any questions about this product by Silver Lilly, contact us by completing and submitting the form below. If you are looking for a specif part number, please include it with your message.